The launch of an United Launch Alliance Delta IV rocket, carrying the GOES-O weather satellite for the United States National Oceanic and Atmospheric Administration, has launched on Saturday, following Friday’s scrub due to unacceptable weather. Launch from LC-37B at Cape Canaveral was confirmed at 6:51pm local time. GOES-O is the second of three GOES-N class satellites, which were constructed by Boeing, based on the BSS-601 bus. 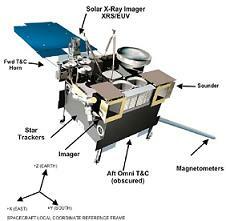 The first, GOES 13, was launched in May 2006, whilst the last is currently scheduled to fly in April 2010. All three satellites were ordered under a “delivery on orbit” contract, meaning that Boeing is responsible for arranging the launch of the satellites. Initially the Delta III was chosen to launch the three satellites, with launches moving to the Delta IV after the Delta III’s cancellation. The launch is being conducted under a commercial licence from the US Federal Aviation Administration. NOAA’s Geostationary Operational Environmental Satellite programme started in 1975, with the launch of GOES 1 on a Delta 2914. Since the start of the programme, fifteen satellites have been launched, of which fourteen successfully reached orbit. Four GOES satellites are currently active, of which two are operational; GOES 11 is currently serving as GOES-WEST at 135 degrees west longitude, whilst GOES 12 is operating as GOES-EAST at 75 degrees west. The two remaining active satellites are GOES 10, a retired spacecraft which is kept online as a backup, and is also used to provide coverage of South America, and GOES 13, which is in storage as an on-orbit spare, and is yet to enter operational service. The Delta IV was built as part of the US Air Force’s Evolved Expendable Launch Vehicle programme, and first flew in 2002. It will lift off from Launch Complex 37B at Cape Canaveral, a complex which was originally built as a backup launch complex for the Saturn I and IB rockets in the 1960s. It was mothballed following the launch of Apollo 5, and subsequently demolished in the early 1970s. In the late 1990s, it was rebuilt for use by the Delta IV, and supports all Delta IV launches from the east coast of the United States. It was last used for the launch of USA-202, formerly NRO L-26, in January. 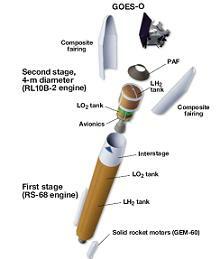 The first stage of the Delta IV is the Common Booster Core, a cryogenically fuelled stage powered by a single RS-68 engine. At launch this will be augmented by the two GEM-60 solid rocket motors. The RS-68 will ignite five and a half seconds before launch, followed by the GEMs at T-0. About sixty-one seconds after launch, the rocket will pass through MaxQ, the area of maximum dynamic pressure. The solid rocket motors will burn out around ninety-four seconds into the flight, before being jettisoned six seconds later. Two hundred and ten seconds after launch, the RS-68 will throttle down to maintain a constant level of acceleration in order to limit loads on the vehicle. About fifty seven seconds later it will shut down. The first stage will separate from the second about six seconds after burnout. The second stage is powered by an RL10B engine, also fuelled by cryogenic propellent, which will perform three burns. On this flight, a four-metre diameter stage is being used. Immediately after separation, the RL10’s extendible nozzle will deploy, with the stage igniting fourteen and a half seconds after stage separation. Ten seconds later, the payload fairing will be jettisoned, exposing the GOES-O satellite to space for the first time. The first burn will last for nine minutes and 24 seconds, which will be followed by a short coast phase, lasting ten and a half minutes, before the RL10 restarts for the second burn, which will last four minutes. After the second burn is complete, the upper stage and spacecraft will coast to apogee, which will take about three hours and forty minutes. The third burn will occur at apogee, and will last 56 seconds, raising the orbit’s perigee and reducing its inclination. Six minutes and twenty seconds later, the rocket will begin a spin-up manoeuvre in preparation for spacecraft separation. GOES-O will separate from the second stage about four hours, twenty one minutes and twenty seven seconds after launch. GOES-O will be deployed into a geosynchronous transfer orbit with an apogee of 35,173 kilometres, a perigee of 6,569 kilometres, and 12.1 degrees of inclination. It has an expected lifespan of ten years, however it carries enough propellent to operate for up to fourteen years. Assuming the launch is successful, it will be redesignated GOES 14 upon reaching orbit. The satellite will raise itself to geostationary orbit by means of an onboard engine, before beginning on-orbit testing. Once this is complete, it will be placed into storage until one of the operational GOES satellites requires replacement. The next flight of the Delta IV is currently scheduled for 30 September, and will carry the WGS-3 military communications satellite for the US Air Force. ULA’s next scheduled launch is of an Atlas V, carrying the heavily classified PAN satellite for an undisclosed department of the US Government.